Trash any number of cards from HQ. Gain 2credit for each card trashed. If the clones were nervous about living in a repurposed fuel tank, they never mentioned it. Instead of needing to draw up above 5 in order to shed a few cards, you can spend 2 to fill your archives with face-down cards and gain s at the same time. This can be a great way to recover from getting Account Siphoned or Vamped or even needing to rez a lot of ice or assets (such as Hostile Infrastructure) during the previous turn. It is also useful just to 'reload' archives if the runner has just accessed them the previous turn as well. Lastly it can be a powerful response to Fisk Investment Seminar. Celebrity Gift gives away information which can be very double sided for Jinteki, intimidation and mind games is a potential benefit, giving away warnings to your opponent regarding your potential traps and tricks (as well as the presence of Agendas) may be a disadvantage. Reuse costs you cards, which represent a each to draw (or replace, after you trash them with this ability) so mechanically it gets you 2 per . Under ordinary circumstances this is not an acceptable return from a card that costs a to draw and 2s to play. This is why you can only make good use of it in Industrial Genomics Decks, where you want to trash cards anyway and it can potentially make what is normally an inefficient set of actions (drawing just to discard into archives) into a profitable bonus. Support cards and potential janky combos? In Industrial Genomics you will want to run Jackson Howard, Crick and Museum of History anyway to enable long term use of your Id ability. Other potential recursion cards such as Allele Repression, Archived Memories, Architect, Team Sponsorship or even Reclamation Order are possible too. 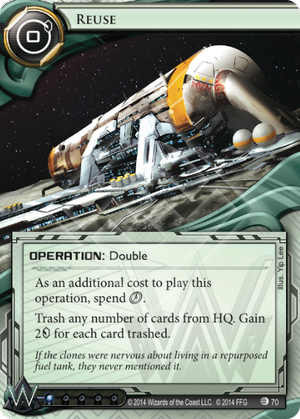 The only other potential use for this card is in Cerebral Imaging: Infinite Frontiers as a way of making a lot of s very quickly (maybe after getting vamped for everything the previous turn or to fund a mega Midseason Replacements (but that will use up 3s). Alternative cards for Industrial Genenomics include: Heritage Committee, Green Level Clearance or Blue Level Clearance which package draw with some additional benefit.